Working with my dear friend, Marie Bostwick, has become an annual treat for me. When she writes her new book for the year, I get to design a quilt (or two!) to go along with the story. Sometimes I design a quilt and she writes about it, other times she writes about the quilt and I create a design and pattern that follows the story. Collaborating with Marie in this endeavor is always fun, and sometimes a bit challenging. Many times she causes me step outside my comfort zone and create blocks and quilts using techniques that are so "not me"! But sometimes, that can be a good thing. 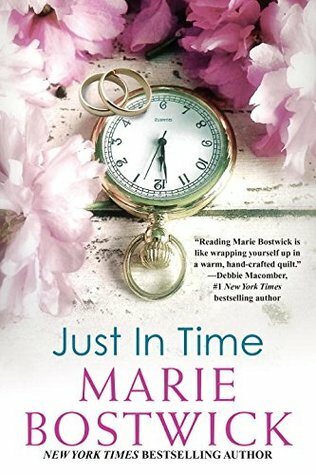 Just in Time, Marie Bostwick's newest novel. Such is the case with Marie’s most recent book Just in Time. This book was released in Spring 2018, and the pattern that I designed for her book is called New Beginnings. As the story unfolds, the main character, Grace, creates a quilt. Using fabric and clothing scraps that she holds special, Grace stitches blocks that summon important memories and moments in her life, creating her New Beginnings memory quilt. The original New Beginnings quilt project. One of the blocks in Grace's quilt is a Friendship Star. Traditionally this block is constructed as a nine patch; a block divided into a grid with three equal divisions on all sides. Quite easy to accomplish in most cases. But when I chose to place four Friendship Star blocks in the center quilt section I created quite a design dilemma. According to the story, Grace chooses to place a plain white square in the center of her quilt. Based on the design that I proposed, that meant that my Friendship Star blocks would have to finish to 8". For those of you who haven't done the math, an eight inch measurement doesn't exactly divide by three neatly to let me build a nine patch block easily. Well game on, and challenge accepted! A friendship star; easy to make when it finishes to 6", 9", or 12". After much thought and deliberation (and quite a number of variations that just didn't work), I was finally able to solve the problem. By changing the construction method from the traditional three square by three square assembly I could easily keep the look of a Friendship Star, but not have to deal with difficult cutting. To discover exactly how I solved the problem, you'll have to check out the free New Beginnings pattern, available to download on Marie's website. Now, as a designer, I always try to create a design that will look amazing in many different styles of fabric. I’ve always felt that's the proof of a truly great design. All A Flutter, a fabric collection quite different from the first New Beginnings quilt colorway. As luck would have it, a mutual friend of ours, Jackie Kunkel, had a signature fabric collection premiering at the same time I was creating Grace's memory quilt. Jackie's line with Island Batik, All A Flutter, was a beautiful array of pinks, aquas and purples designed with birds, flowers and dragonflies. Truly a very different grouping from the plaid and flannel shirting scraps that Grace used to create her memory quilt in the book. So I decided to remake the quilt with this palette. As you can see when you look at the two extremely different colorings of the exact same design, both are successful and interesting. If a quilt design looks good in multiple colorways or fabric styles, it's proof of a good design. Recently the Running With Scissors Quilters, a team made up of Studio 180 Certified Instructors Heidi Chase, Kathy Webb, and Elle Cicak, held a retreat where they taught the New Beginnings pattern. Their students created some amazing versions of this quilt. The variations present in these quilts show the true range of the pattern design. It can work with modern fabric, Civil War fabrics, or those much loved batiks. The difference is amazing and wonderful. Variety is the spice of life, and quilting! So here's the challenge I'm issuing to you; use your favorite fabric collection to create a New Beginnings quilt of your own and share the results with both Marie and me! And maybe while you're working your way through the planning, cutting and stitching, take some time to enjoy Marie's latest work (I'm a huge fan of listening to an audiobook while I work). Just in Time is an uplifting, inspiring story that I just know will warm your heart. I can't wait to see what you version of New Beginnings will look like! Remember to share your quilt with us on Facebook or Instagram (#NewBeginningsPattern180). And here's a bonus blog post from The Quilt Rambler from few weeks ago on her New Beginnings story too!